John Marshall (1663-1725), an optical instrument maker at the sign of Archimedes and Spectacles, Ludgate Street, London, advertised this microscope for viewing the circulation of blood in 1693. For such examination the base is fitted with a lead counterweight, so the body tube can swing beyond the edge of the base support. A means for maintaining the object in the optic axis when the main pillar is inclined is also provided. This was a significant step forward in the evolution of the microscope. A hallmarked sterling registration plaque is fitted within the instrument drawer. 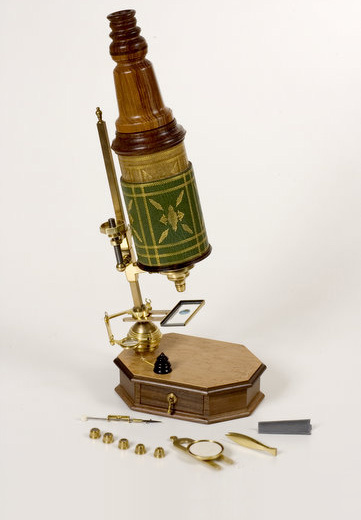 This microscope was reproduced from the original antique instrument #0189 in the McCormick Collection. A rectangular mounting pillar is attached to the base (an octagonal hardwood drawer cabinet, 5 7/8" x 8", with the top surface veneered in birds eye maple) by a ball and socket joint which permits inclination of the pillar and body. The stage has a circular brass plate, 1 7/8" diameter, with a turned ledge into which a black and white ivory plate fits. It is mounted at the end of a brass U-shaped arm which fits between a clamping but and shoulder above the ball and socket joint. This arrangement maintains the object in the optic axis on inclination. A biconvex condenser lens, 13/16" in diameter, is attached to the side of the base with a jointed arm. The cardboard body tube, 3 5/8" i.d. diameter, is covered with green shagreen (Dasyatis). The inside cardboard draw tube, 4 1/4" long, is covered with a dark green leather. The turned wooden eyepiece contains a biconvex field lens, 2 1/4" diameter, and a biconvex ocular, 1 3/8" diameter. Any of the six objectives in brass mounts, screw onto the threaded brass nose piece, 1 1/2" long. The coarse adjustment is accomplished by a sliding movement of the pillar sleeve, with fixation set by a jam screw. A fine adjustment screw moves the secondary adjustment pillar sleeve. Accessories include a fish plate, leaded coffin to confine fish, brass tweezers, stage forceps, flea glass in ivory box, and an ebony specimen holder. The microscope is 17 1/2" tall in close upright position. Both pillar and objectives are engraved with the numbers 1 to 6; pillar marks indicate positions for the objective powers.